How Do You Properly Size Your System Pump & Piping? Properly pumps and piping are critical to the success of your new solar thermal system. 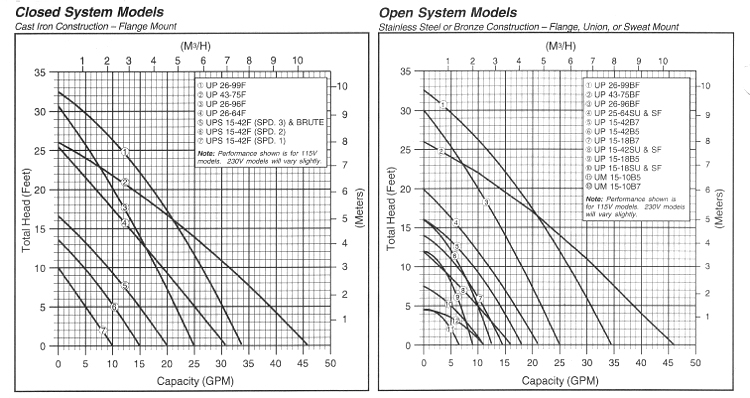 In order to operate properly (and at top efficiency), your solar array needs to fed with the amount of fluid called for in the design specifications. The design flow rates for SunMaxx solar collectors are listed on the collectors’ spec sheets and your installation guide. 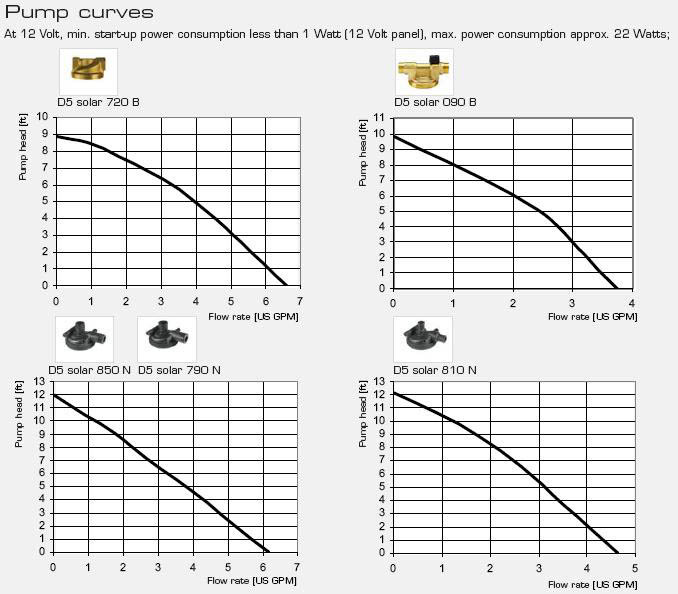 Simply multiply the flow rate your collector by the number of collectors you are using to get the flow rate for the entire solar array. Use this number to size your pump and piping using the steps outlined below. To prevent erosion and corrosion inside your piping which can damage your system, you should aim to keep the velocity of the fluid in any loop of your solar thermal system below 5 ft/sec. Start by determining your flow rate requirements and using figure 1 below, follow that flow rate until it intersects the 5 ft/sec line (anything to the right on the chart will give you velocities under 5 ft/sec). Once you choose the appropriate pipe size, follow that line till it crosses your design flow rate (to the left, you will see the pressure drop in PSI for every 100 ft of pipe). To determine the pressure drop in any branch of your solar system, you need to determine the "equivalent length" of these branches. The "equivalent length" accounts for (adds) the lengths of the corners and bends in each branch as well as the straight runs. Use table 1 below to determine the "equivalent length" of your branch (straight length plus lengths for other fittings). Now you can use the equivalent length together with the with pressure drop per 100 ft to calculate the total pressure drop for the loop. The pressure drop through the collector row can be approximated by taking half the flow rate through the row and assuming that that flow rate travels through the combined distance of the upper and lower headers. Please be aware that glycol systems will typically add about 20% pressure drop to your calculations. This should be accounted for when sizing the pump for glycol systems. Additionally, the pumps for drainback systems must be large enough to overcome the head loss necessary for pushing water from the drainback tank to the top of the collector array as well as its typical circulation duties. Once you know your flow rate and pressure losses, sizing your pump is quick and easy (though you may need to convert your pressure drop from PSI to "feet of water" as most pump charts use this measurement). To convert PSI to feet of water simply multiply your PSI by 2.31. 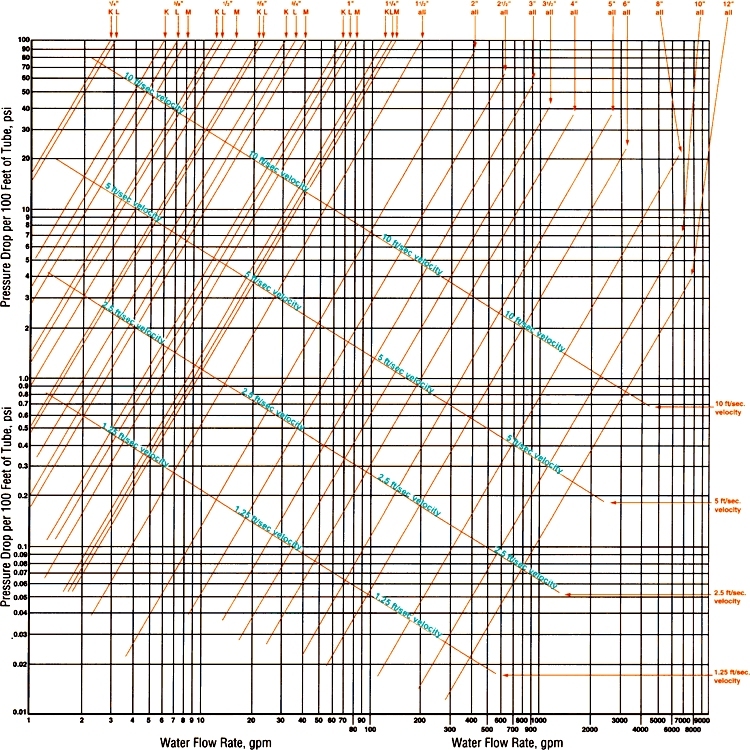 Simply find the point on the pump chart where your pressure drop and flow rate cross – any pump whose curve lies above this point is appropriate for your system (a note from our engineers: if the pump curve is very close to the intersection point, you may want to move up the next higher model if possible).